Hakea macrorrhyncha is a tall, upright shrub reaching a height of four metres. Dark green circular leaves are grooved, crowned with a sharp point and up to nine centimetres long. Copious white flowers cover branches in spring. 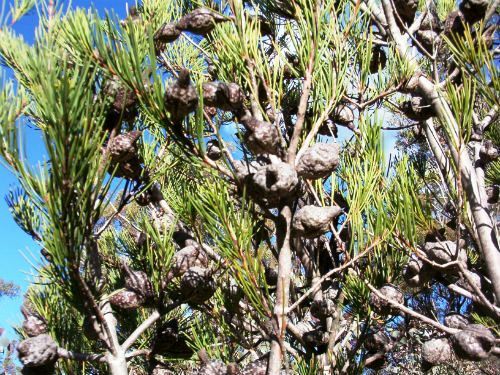 They are followed by large woody fruits with a prominent beak, covered with rounded blisters and about three centimetres long. The fruits are a prominent feature and large numbers clusters along the branches. H. macrorrhyncha is rare because it has limited distribution. The Torrington State Conservation Area, Gibraltar Range National Park and Bald Rock National Park in northern NSW and Girraween National Park in southeast Queensland protect populations. H. macrorrhyncha would be an interesting addition to a shrubbery. The prickly foliage provides safe nesting sites for small native birds. The species was named in 1996 from material collected in Girraween National Park, southeast Queensland. The species name is derived from the Greek: macros, long and rhynchos, nose, referring to the long-beaked fruit of the species.